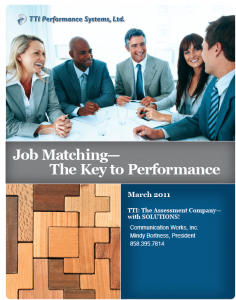 Job Matching- The Key to Performance - Communication Works Inc. Communication Works Inc. Job Matching- The Key to Performance - Communication Works Inc. There is a clear connection between engagement, performance and profit. It is imperative to drive performance results at all levels of the organization in order to seize market position and steer growth. Recruiting talented candidates is not enough; it’s crucial that people are assigned to the specific roles where their talents will have the greatest impact on achieving company goals, and where they are most likely to remain onboard fully engaged. Matching each person to the right job using the TTI job matching process outlined here will give you the ultimate edge over competitors: it builds a superior performance work place and boosts employee morale and engagement. When they are up, so are overall company productivity and profits.